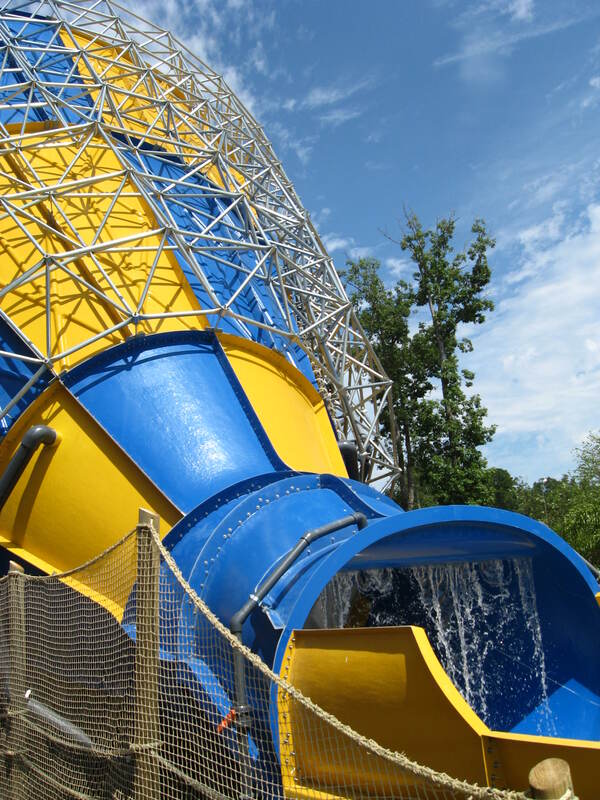 In 2002, after providing most of the attractions to the Koch family, owner of Holiday World/Splashin Safari (Santa Claus, IN), Proslide approached them with an innovative new prototype. It would feature an enclosed slide leading to a large half pipe where the raft would drop at 45 degrees, go up the opposite wall and then do one to three more trips up the walls before being flushed out at the bottom. The curvature of the walls were engineered to provide a safe ride path and make sure the vehicles make it to the bottom in the most comfortable way. 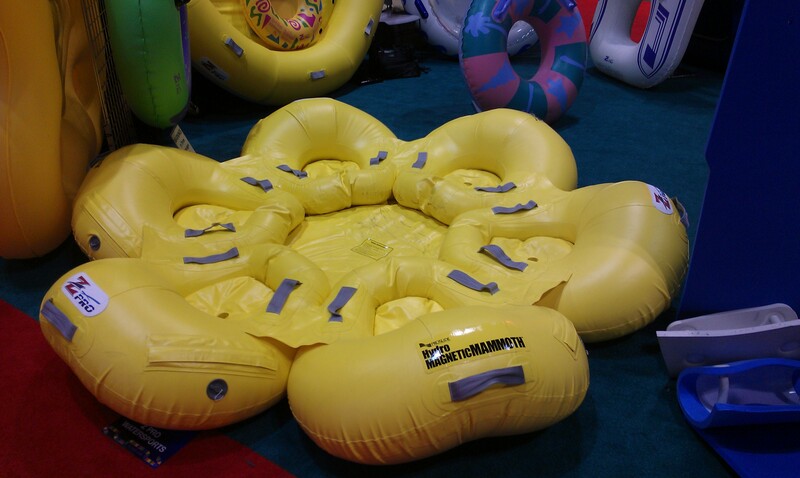 The next innovation is the rafts themselves where instead of the regular round rafts used until then on family raft slides such as the Proslide Mammoth, new 4 person tubes were designed. Using a cloverleaf design, those rafts enhanced speed and provided a safe seating area even when going over waves of water. Those are exclusively fabricated for Proslide by Ztec Inc. 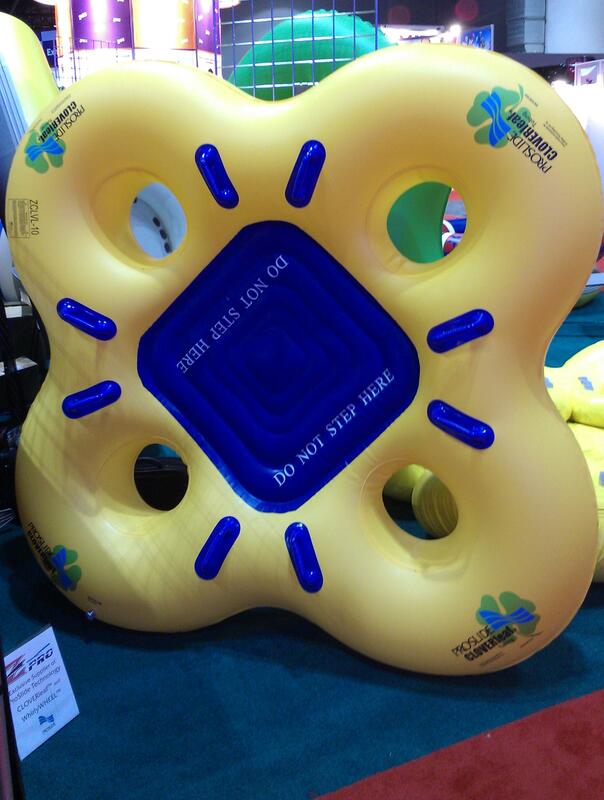 This picture shows a Cloverleaf raft. So, Zinga was about to start construction when in January 2003, Proslide approached the park and proposed a design modification. 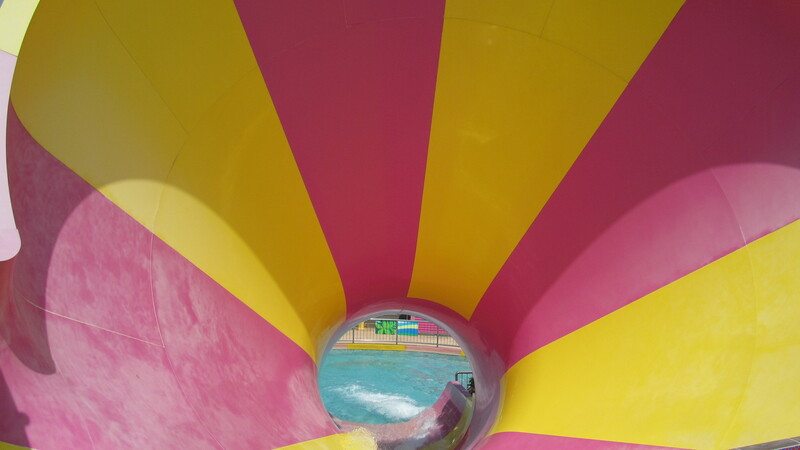 The half pipe would have the top enclosed and the slide would become a 60 feet tall funnel that lay on its side. Plus, the access platform is placed strategically in front of the funnel, so that people can see the rafts when they freefall down. Zinga features a 270 degrees helix after leaving the launch platform and then, it dives down into the funnel. 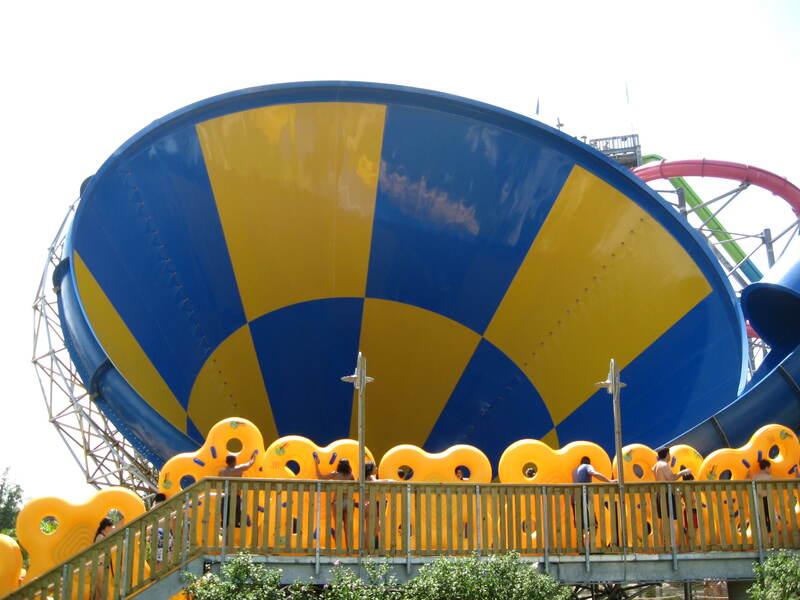 In 2004, Holiday World added a conveyor belt to take the rafts up to the platform from the splash pool; this is a feature Cedar Fair and Kings Island adopted for their Tornado slide installations. Picture of Zinga at Holiday World in the background. 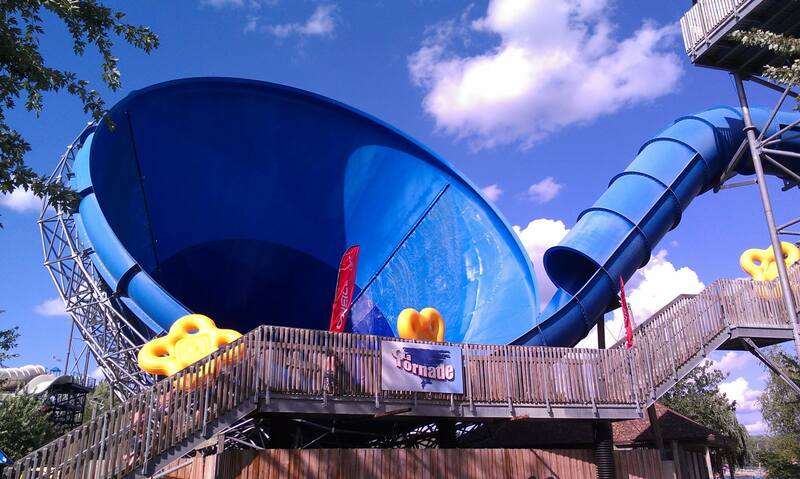 Flex provided us with this picture of Zinga at Holiday World. Two more slides opened in 2003. 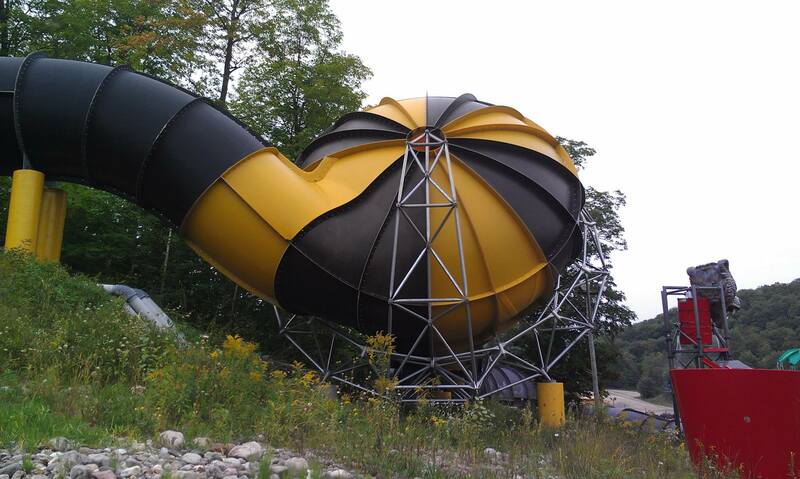 High Anxiety at Action Park (Vernon, NJ) features the same funnel, but the slide portion before is different. It is much simpler and is behind the funnel. The funnel is built on a hill side and when the raft leaves the platform, it drops a little, turn right and drop right into the Funnel. Tornado at Six Flags New England (Agawam, MA) was the headlining attraction of the revamped Hurricane Harbor that debuted that year. It was shoe horned into a compact location between a Chance Flying Bobs dry ride and a 4 slides tower and it replaced the water park old entrance. The design itself was more aggressive, as it featured a straight steep drop from the platform directly into the funnel. This lead to concerns about the height that the rafts reached and for the first season, it mostly used standard single passenger tubes. 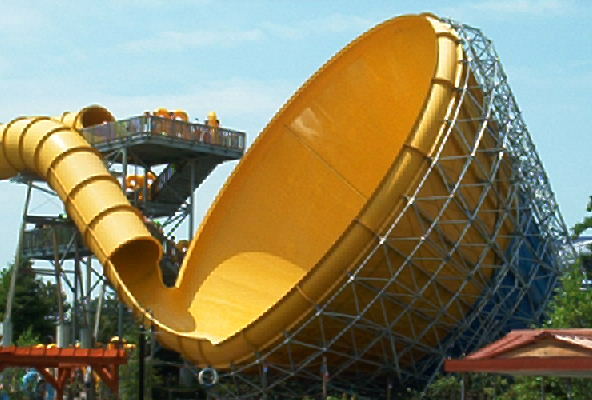 In 2004, the slide was redesigned and the entrance to the funnel changed to the current configuration. This fixed all the issues and it run since with the 4 passengers Cloverleaf raft. Also, the name given by Six Flags happened to be the model name for Proslide, so from now on, I will use Tornado to describe the model line in general. Post 2004 configuration of the Tornado at Six Flags New England. This is the side view of the Funnel. Notice the steel bracing. In 2004, Six Flags bought two more Tornado and they were mirror images of the revised Six Flags New England configuration. The drop entrance is on the right, versus on the left for the original. The first two in 2004 opened at Six Flags Magic Mountain (Valencia, CA) and Six Flags Over Texas (Arlington, TX) Hurricane Harbor parks. 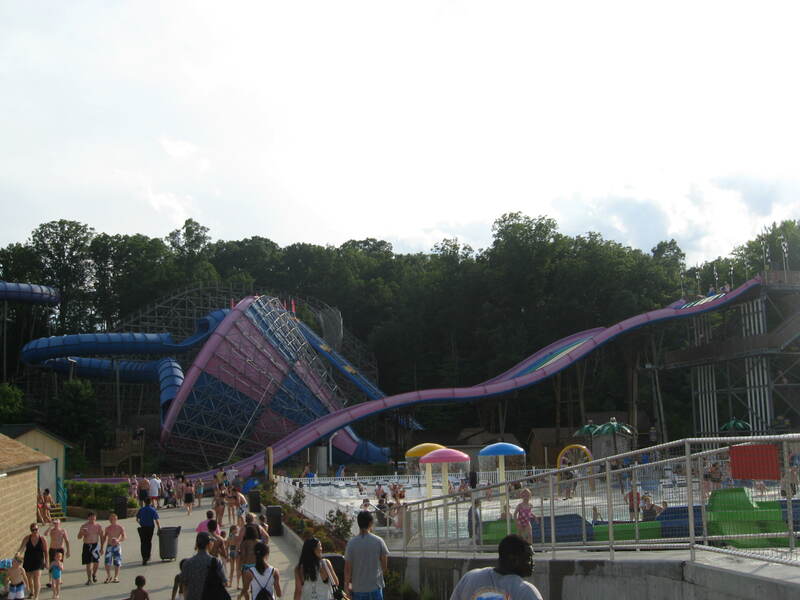 By 2010, every water park Six Flags owned at the time were equipped with Tornado slides. Those are known as the “Rattler” layout and many parks purchased them as well since they are compact, high capacity and very thrilling. On average, the slide is 137 feet long. 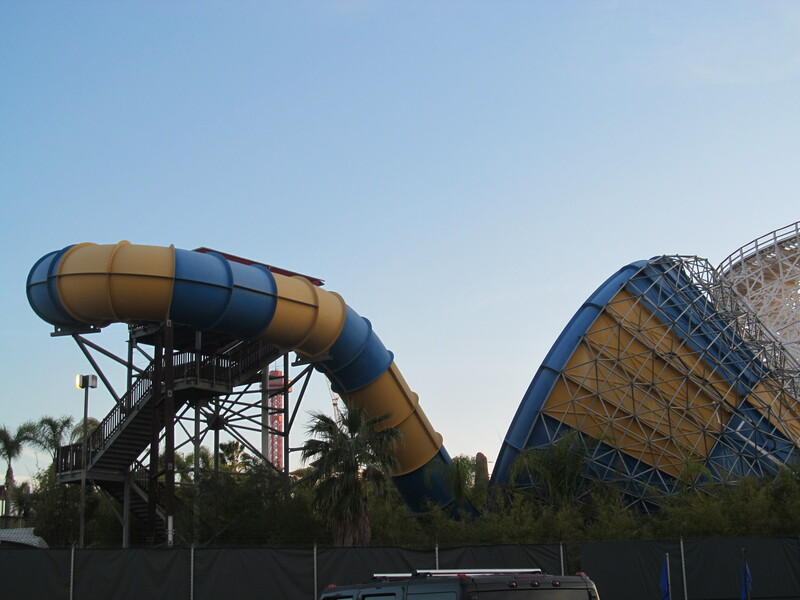 This is the Six Flags Magic Mountain Hurricane Harbor Tornado. The Tornado at Hurricane Harbor Los Angeles features a different logo than the others. A nice look inside the slide. One interesting thing about the slide is that it was built next to the Bamboo Racer mat racing slide on the lower level of the park. In 2015, when Six Flags turned part of County Fair into the Steampunk District, there was left over paint left when Scream (Bolliger & Mabillard Floorless Coaster) was repainted. This paint was used to repaint the exterior of the flume on Tornado and integrate it in the Steampunk District when looking at it from the parking lot. You can see the contrast between the original yellow and blue colors that are on the surface the raft slides on and the exterior new colors. Six Flags installed a Tornado “Rattler” at Six Flags Great Adventure Hurricane Harbor (Jackson, NJ) in 2010. 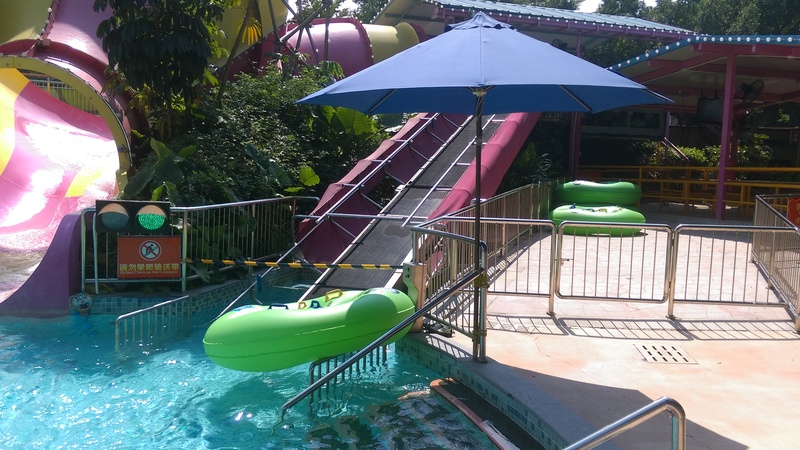 As you can see in the pictures, their approach toward line management is to have a lot of rafts and thus, people wait in the stairs and observation platform for the slide. The exit of the Funnel at Hurricane Harbor New Jersey. The Tornado Rattler at Six Flags Great America Hurricane Harbor (Gurnee, IL). 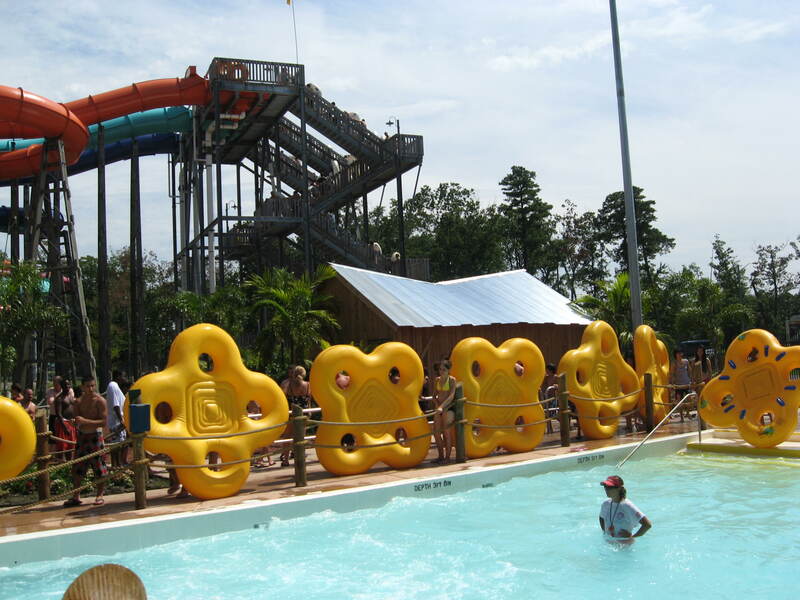 It was installed in 2006 as a second year expansion to the water park that brought record crowds to the park in 2005. 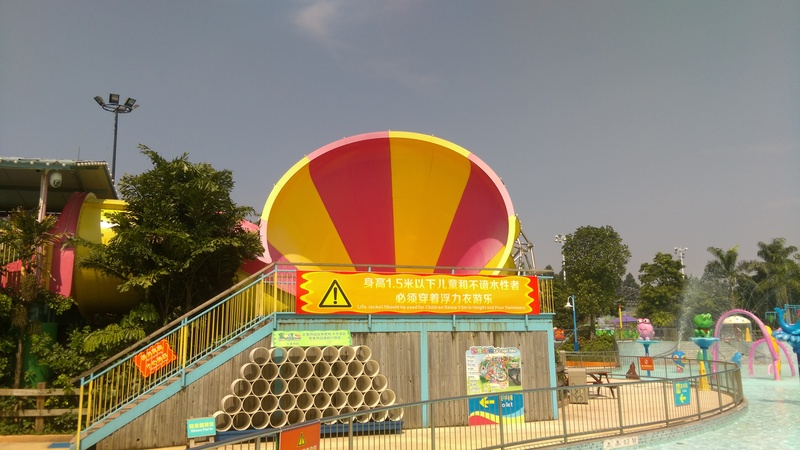 This is another of the standard Rattler Tornado, installed at Janfusun Fancyworld (Yunlin, Taiwan). 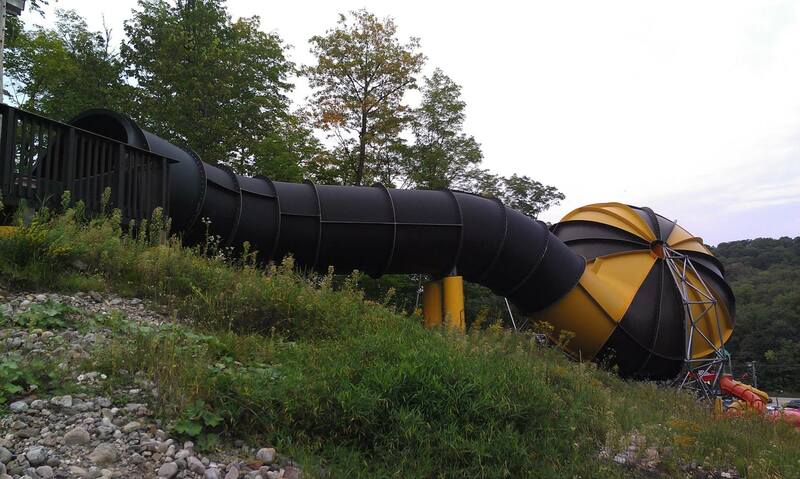 In 2005, Super Aqua Club in Pointe-Calumet, QC installed this slightly modified Tornado Rattler. Known as “Tornade”, the park took the opposite approach to Six Flags for line management: everyone wait near the stairs of the ride in a traditional amusement park waiting line. Groups of 4 are strictly enforced and the number of rafts calculated so that when you get your raft, you go straight up the stairs and only have to wait 2-3 minutes in the structure. Capacity is very good and this is the park that I have to say has the best capacity on a Tornado in the world. The same system is in place for their two family raft slides and the Typhon, their Behemoth Bowl that I will detail later. The exit flume is a little longer on this installation. If a tornado hits, there will be damage, right? The park themed the surroundings of the attraction with broken down vehicles and destroyed light poles. 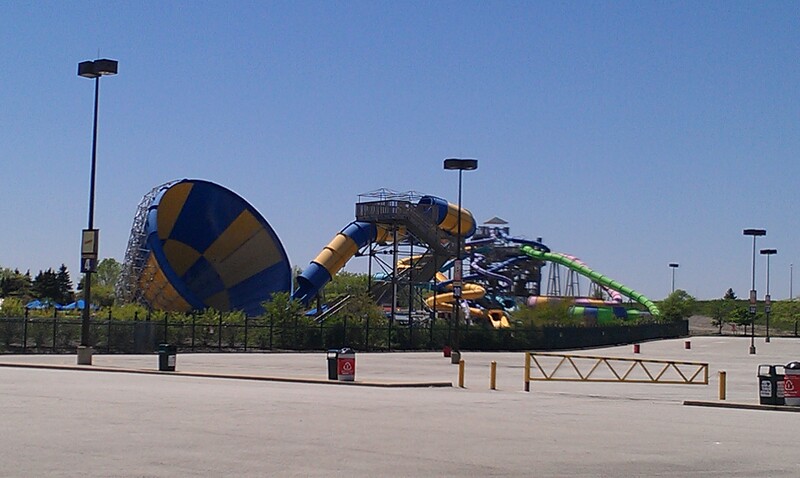 A nice side view of the Tornade at Super Aqua Club. A look inside the Funnel. As you can see, the park went with two tones of blue for the colors. In this picture shot from a nearby slide tower, you can see the Tornade. 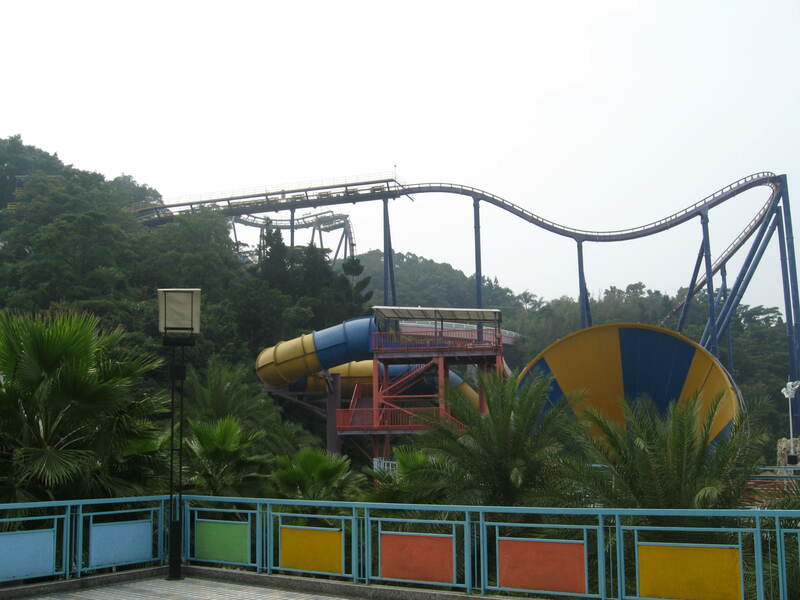 The Chimelong Water Park (Guangzhou, China) Tornado 60, known simply as the Tornado in the park. In 2007, Proslide launched a smaller version and in conjunction to that, the regular Tornado is now called “Tornado 60”. 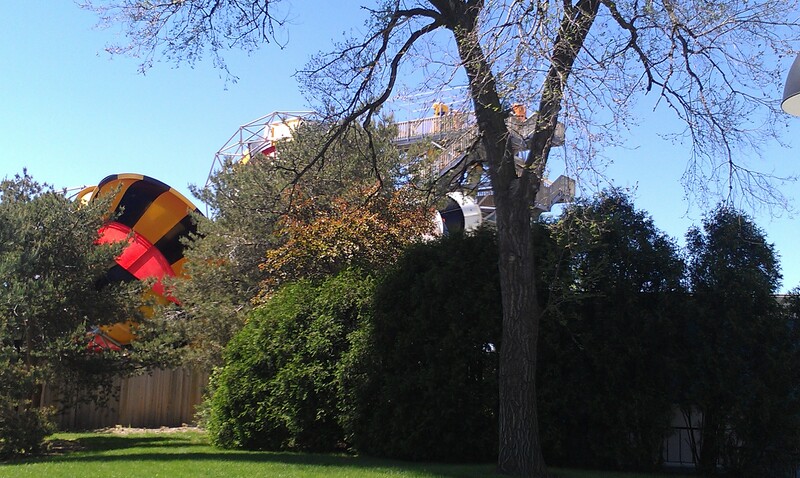 The new version is the Tornado 45, with a 45 feet tall funnel that is a flexible option for parks with space concerns. 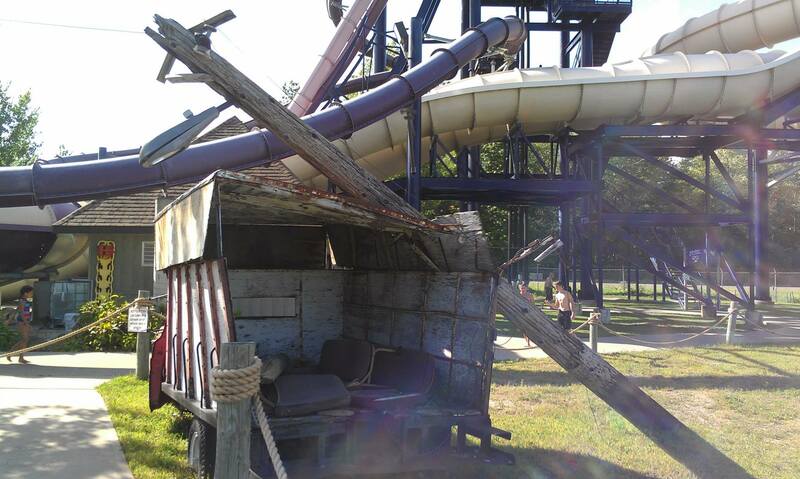 The first one to open was the Tornado at Funtown/Splashtown (Saco, ME). 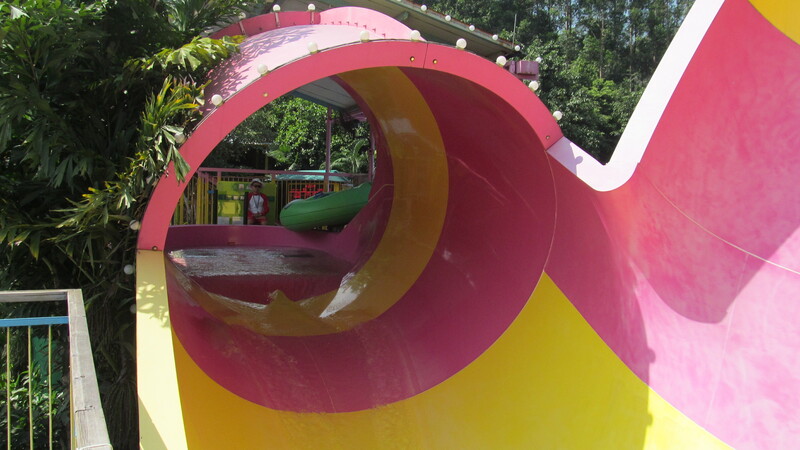 The unique at the time feature was that the exit of the funnel did not lead straight into the splash pool and instead, you have another small enclosed section. Add that to the longer pre drop section and you have a nice and long water slide experience. 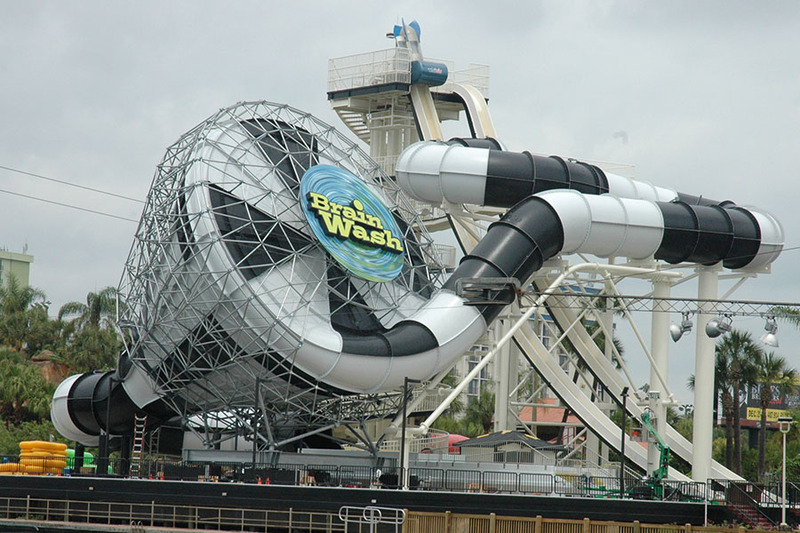 In 2008, Wet n Wild (Orlando, FL) introduced Brain Wash, an enclosed Tornado 45. Notice the extended post funnel flume. Picture appears courtesy of www.proslide.com. A close-up of the Tornado 45 element of Brain Wash. The steep drop on Brain Wash.
To fit the available land, a sharp curve follows the Tornado. The black piece mounted on top of the flume is for special light effects inside. To ride Brainwash, you need between 2 and 4 riders. You step on this scale and if your combined weight is under the 600 lbs limit, you are then given a token with the number of people in your group. You then collect a tube and go around the slide. You then show your token and drop off your tube at the bottom of the raft conveyor. When the ride opened, there were no raft conveyor and it was extremely difficult for riders to take the large tube up the spiral walkway. The spiral walkway leading up to both Brain Wash and Der Stuka. This is the final section of the Tornado Alley. 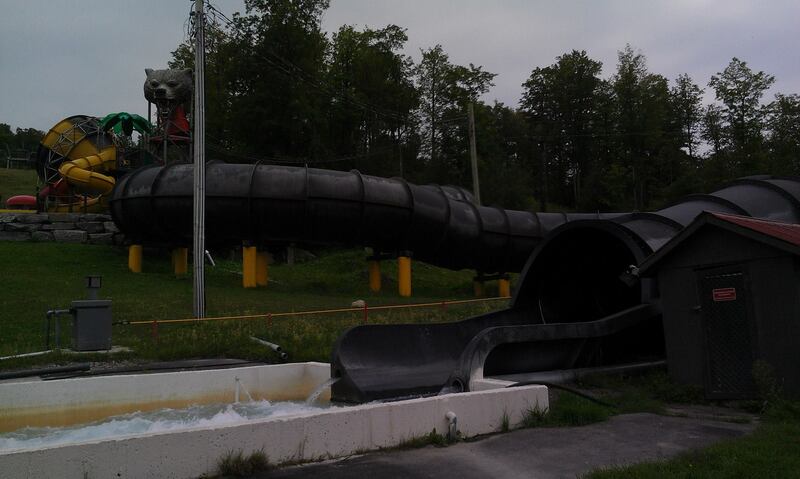 The start of the slide that leads down into the Tornado 24 funnel. 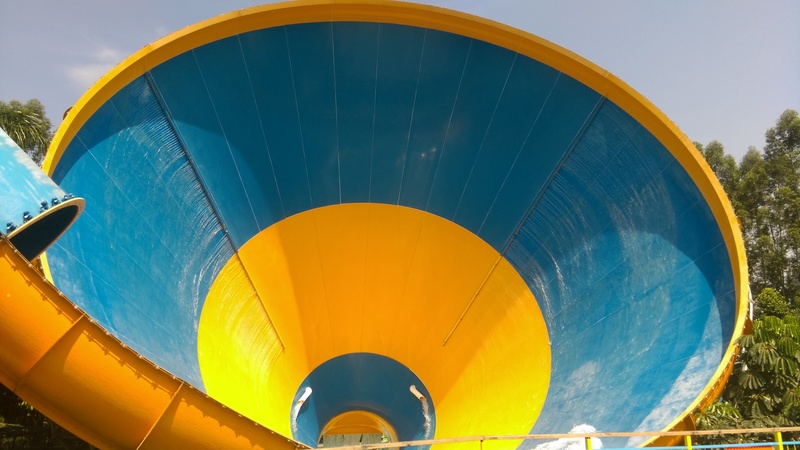 You can see one of the two funnels of “Wipeout”, a Tornado 24 + Tornado 24 hybrid slide that opened in 2011 at Six Flags Great America (Gurnee, IL). A better view of Wipeout was provided by Flex. You can see the yellow, black and red funnels on the right. 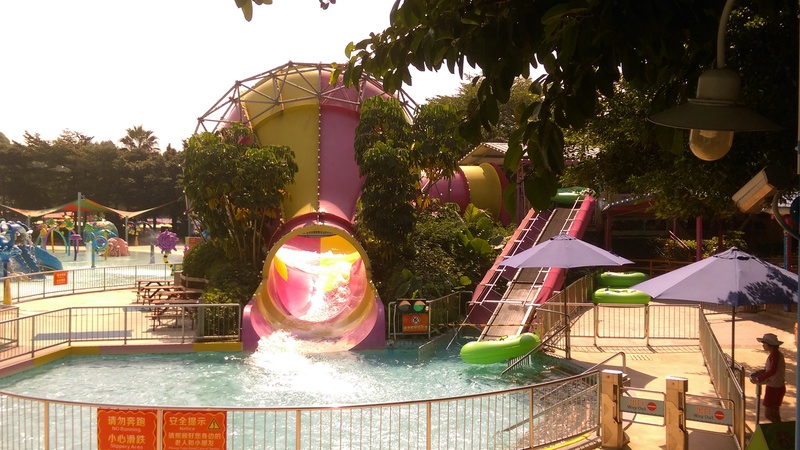 Adventure Cove Waterpark at Resorts World Sentosa opened in 2012 with Spiral Washout, a Tornado 24 slide. Spiral Washout starts with a tight and intense spiral before the Tornado 24 funnel. Siam Park (Tenerife, Canary Islands) introduced Kinnaree, a Tornado 24/TornadoWall 60 Hybrid. Opening in 2012, this spectacular attraction was the first new attraction to the park and to blend in with the rest of the park, was constructed in rich shades of green and tan. Flex provided us with this great picture of Kinnaree. In 2013, Piscilago (Melgar) introduced Piscihuracanes, a complex with two Hybrid slides. We already talked about the one on the left here: https://parkvault.net/2016/01/22/kidz-and-hybrids-part-3-of-our-bowl-serie/ and the one on the right is a Tornado 24/Tornado 24 Hybrid. A close-up of the second Tornado 24 and following spiral. The very intense and compact spiral at the end. Side view of the steep directional change on the spiral. The second Tornado 24 funnel. 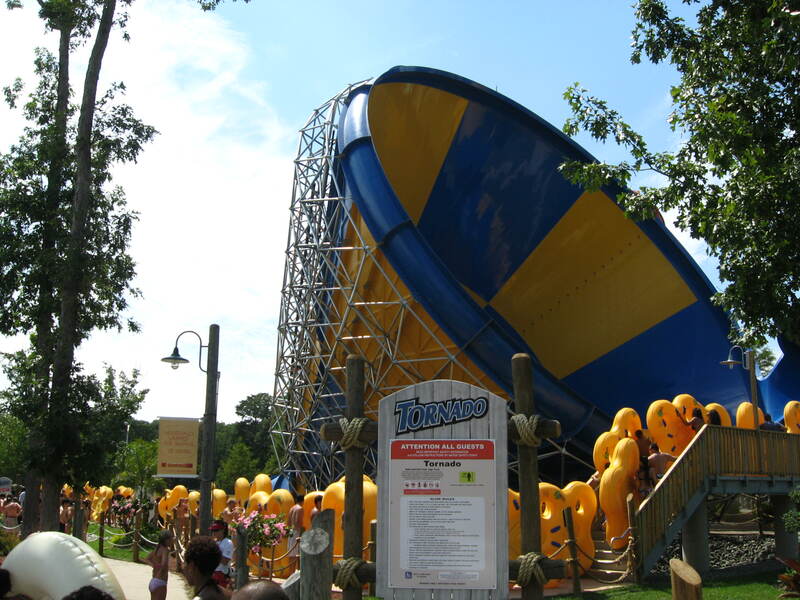 In 2010, Proslide launched the final part of its adult Tornado line, the Topsy Turvy. Featuring unique TopsyRiver vehicles that look like standard tubes, but with a more stable and wider shape to keep the optimal ride path. 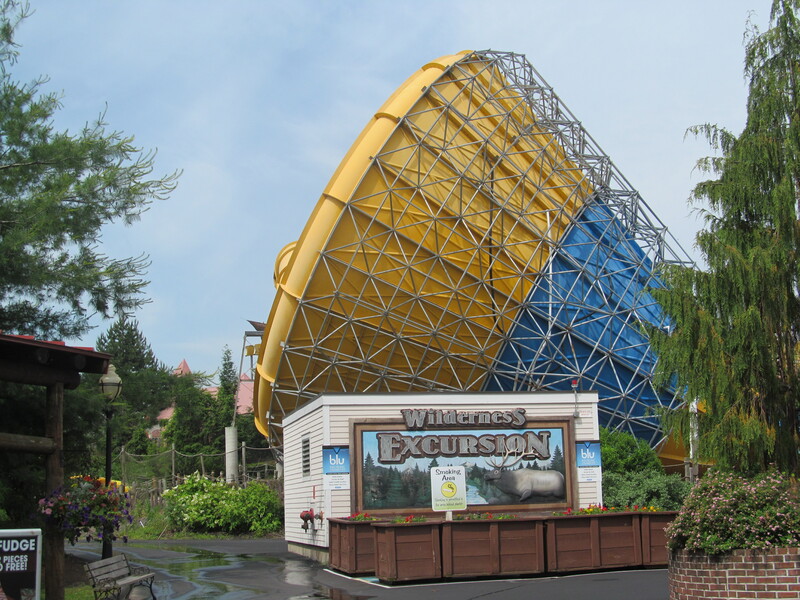 2 to 3 12 feet Funnel are usually featured and 3 installations opened in 2010 at Darien Lake (Darien Center, NY), Adventureland (Altoona, IA) and Aquatica Florida (Orlando, FL). 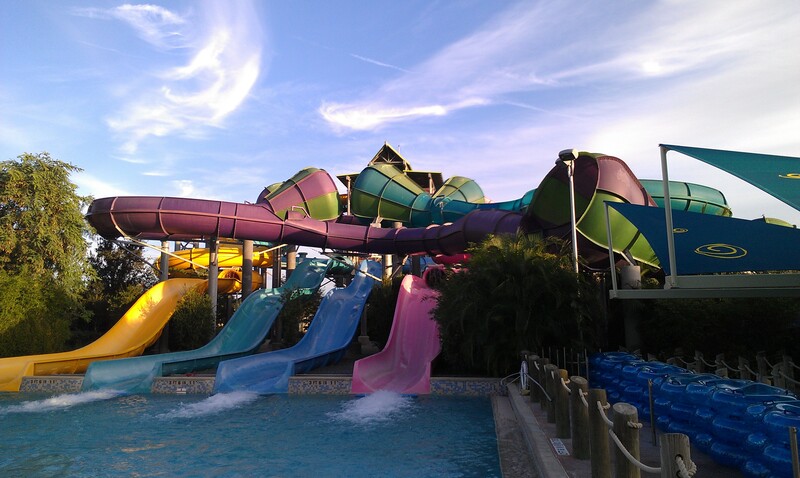 The Aquatica slides are an intertwined pair that crosses each others as the rafts make their way down. 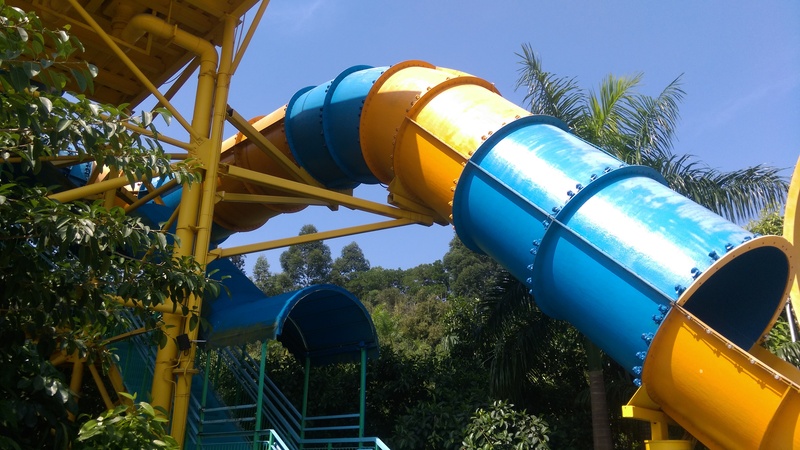 It was retrofitted to an existing White Water West tube slide complex. The line was renamed to “Tornado 12” and it now use larger Tornado 18 funnels. Aquatica decided to use another type of vehicle for Omaka Rocka. For passenger comfort, those tubes have that bump for passengers to lie down on. 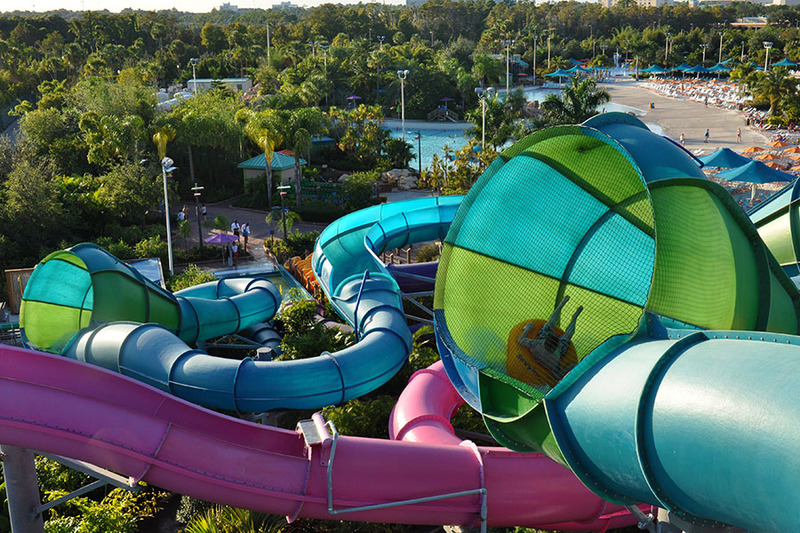 This is the Omaka Rocka at Aquatica. 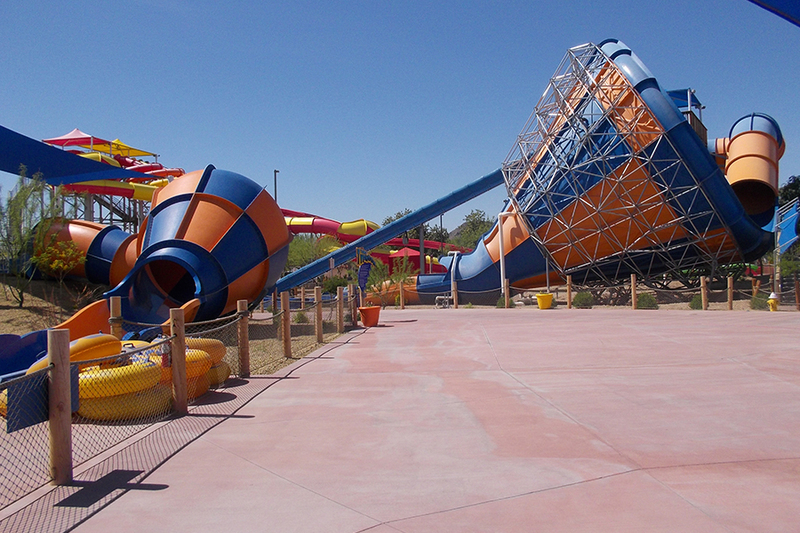 Notice the close interaction with the 4 Whitewater Inner-Tube slides. Omaka Rocka use translucent tubes. One of the ride’s funnel. Omaka Rocka features two separate slides that start by mirroring each others. In this picture provided by www.proslide.com, you can see a close look of a rider in one of the Tornado 12 funnel on Omaka Rocka. 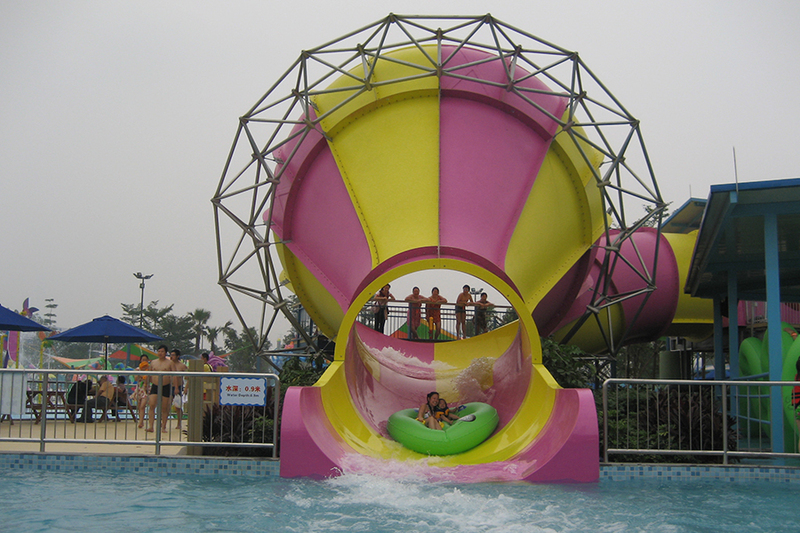 In 2012, Adventure Cove Waterpark at Resorts World Sentosa in Singapore opened. One of the slide at the park opening was the Tidal Twister, featuring two Tornado 12 funnels. In 2012, Proslide combined the award winning Hydromagnetic Mammoth with the Tornado 60 and thus, this fantastic Hybrid attraction was born. Using custom 6 passengers rafts, Proslide actually incorporate a “skirt” under the raft so that instead of having to replace the expensive raft, the skirt will wear out and can easily be replaced. The Hydromagnetic Mammoth raft without its skirt. 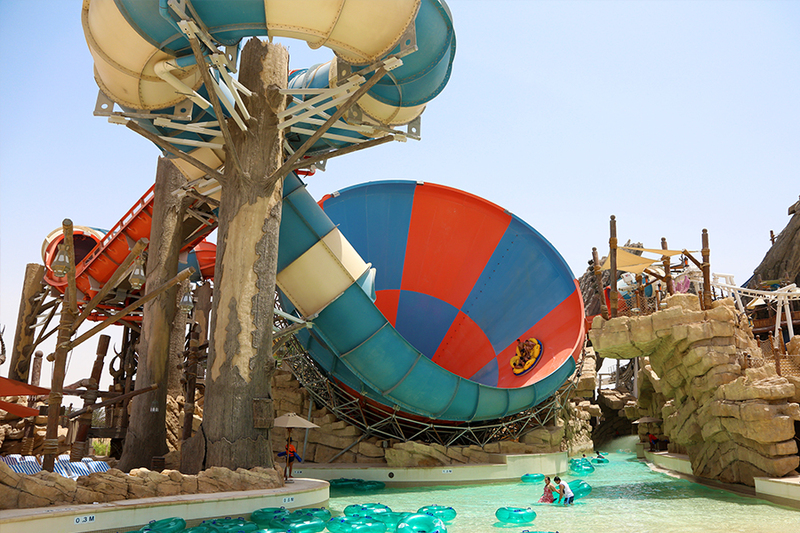 The Dawwama at Yas Waterworld (Abu Dhabi, UAE). It is intertwined with a regular Hydromagnetic Mammoth. Picture courtesy of www.proslide.com. Last, Proslide introduced around 2007 a family friendly version of the Tornado. Using either a 12 or 24 feet funnel, it was engineered so that small kids could safely experience the same attraction as the grown ups. The Mini Tornado also has an observation platform like its larger sibling. One difference with the adult version is that there are no water curtains installed in the funnel. The funnel and entry slope was calculated to eliminate those, thus reducing operating costs. The launch platform and initial slope. The ride uses the WhirlyWheel raft and the park even built a conveyor to take them to the top. In 2015, the world’s longest Tornado opened at Adventure World (Perth, Australia) and could be considered to be a Mammoth/Tornado Hybrid given its 853 feet long course.. The attraction is called the Kraken and feature exceptional theming on the launch platform and near the splash pool at the end. 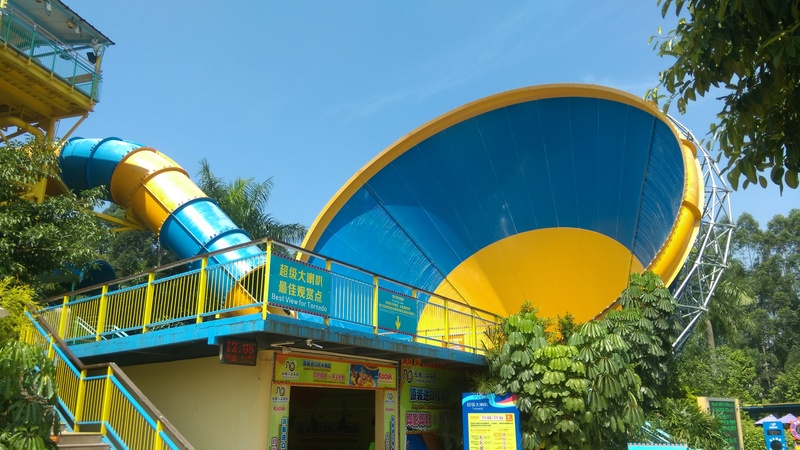 This entry was posted in Water Ride and tagged Adventure Cove, chimelong water park, mini tornado, mont cascades, proslide, Resorts World Sentosa, Rides, six flags great america, super aqua club, tornado, Tornado 12, Tornado 24, Tornado 60, Water, wet n wild. Bookmark the permalink.